The trailer has been released for PET GRAVEYARD, a new supernatural thriller from Proportion Productions and Millman Productions. PET GRAVEYARD concerns a group of friends tormented by the Grim Reaper and his sinister pet after they undergo an experiment that allows them to revisit the dead. The film marks the directorial debut of Rebecca J. Matthews (producer of MOTHER KRAMPUS), from a screenplay by Suzy Spade. Scott Jeffrey (THE BAD NUN) produces. Jeff Miller (THE TOYBOX, OUIJA HOUSE) is executive producer. Below you can check out a short clip titled 'The Cat' and below that the official trailer. 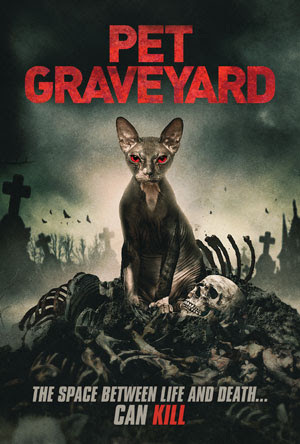 PET GRAVEYARD is scheduled for release on DVD/Digital on 2nd April. Uncork'd Entertainment is handling worldwide distribution.